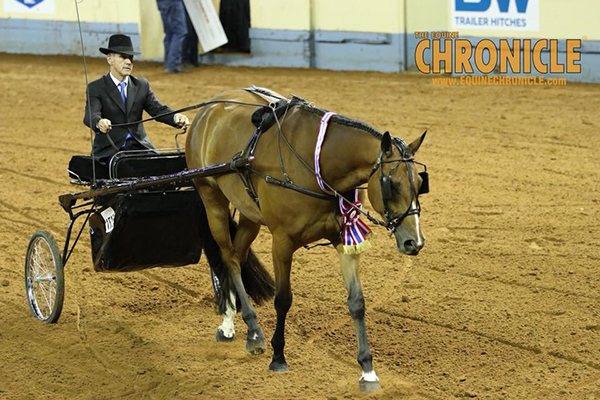 Kevin Dukes was in the cart of Al Wayz On Your Mind for owner, Gerri Leigh Pratt, in Junior Pleasure Driving at the 2018 AQHA World Show. The 17.3 hand, bay stunner is by Allocate Your Assets and certainly takes after his father in looks, movement, and size. Nicknamed “Willie Nelson,” this gentle giant is only four years old. 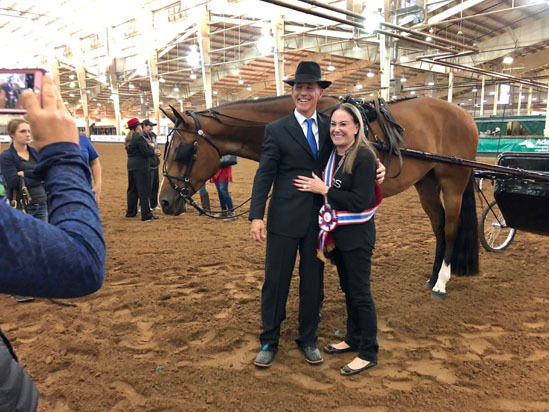 Gerri Leigh purchased the gelding in January of this year and has since shown him in Amateur Hunter Under Saddle classes at shows in California, Nebraska, and New Mexico. She even qualified to compete in Amateur Hunter Under Saddle here at the show, but only time will tell if she will ride in the class. “We will wait and see how the Junior Hunter Under Saddle finals go first,” Gerri Leigh laughs. To bring Gerri Leigh back to the show pen, after a 30-year absence, it’s clear that Willie Nelson is one very special creature indeed. Serendipitously, both Gerri Leigh and Kevin were thinking of exactly the same horse, when it came time to look for a prospect. “Gerri Leigh called me and said that she had a friend who might want to do Pleasure Driving, but she would want the best horse around. I said that there’s only one I know of,” Kevin says. Now that Willie Nelson has added Pleasure Driving to his repertoire of skills, Kevin and Gerri Leigh are looking at adding other English events in the future. Kevin also hopes to get Gerri Leigh back in the cart. “I used to drive and that was enough,” Gerri Leigh says. “It’s still not over. We have this banter back and forth that I will get her back into it!” Kevin laughs. The Reserve Champion was Chuck Briggs with Blue Kaluha. Third was Lee Paul Shinn with Metallic Iron. Fourth was Alice Holmes with Hoo Got The Blues. Fifth was Travis McColley with Al Get Your Shine On.